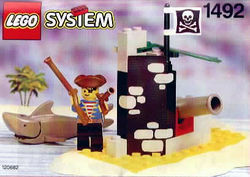 1492 Battle Cove was a set released in 1992 as a part of the Pirates theme. The set featured 25 pieces and 1 figure. The set also included a Shark. The pirate is not First Mate Rummey as he has black pants instead of the gray worn by Rummey. Facts about "1492 Battle Cove"
This page was last edited on 4 May 2016, at 00:03.